Many of you know that for my day job, I work at In The Beginning Fabrics as their wholesale customer service person. One of the fun aspects of working there is that we all get to show off our own various quilting projects to a very appreciative audience. When I finished the top for Antelope Canyon, my co-workers had a great response – and Jason Yenter (president and head fabric designer) was pretty excited about my newest design. A few months later, Jason was working on a new fabric line called Texture-Graphix, which is a 12-piece group of neutrals in 3 subtle textures. Another bonus of working there is that occasionally Jason uses my patterns with his fabrics – it shows that my patterns are versatile, and it gives my work greater exposure (thanks Jason). When he told me he was going to mock up Antelope Canyon using the black/grey/cream fabrics, I have to admit that I was skeptical that it would yield an attractive quilt. Silly me for doubting Jason’s vision and skills! Over that weekend he did in fact make the quilt (via Photoshop) and even draped the quilt on a bed in a gorgeous modern apartment that we’d all like to live in (also via Photoshop). 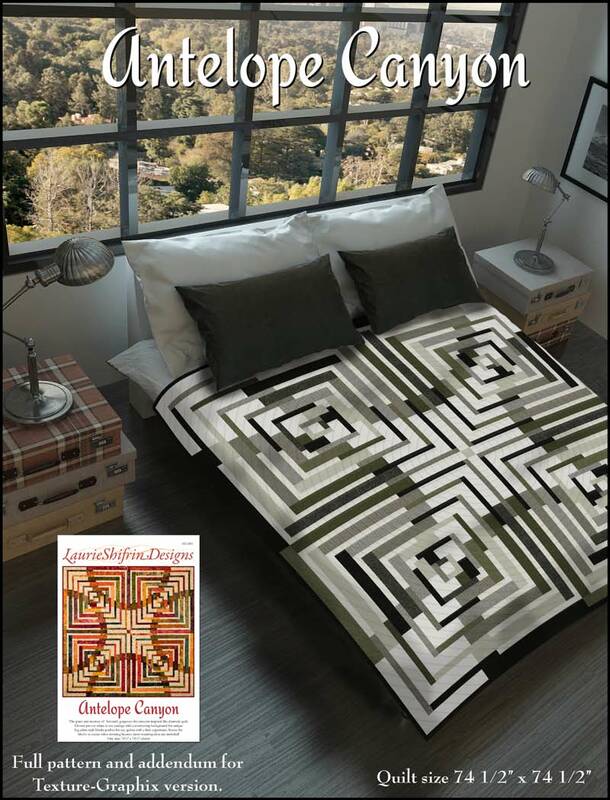 Wow – what he created using my design and his great fabrics is a modern, masculine, fabulous quilt!!! And the really good news is that our team of sales reps have been showing it to stores in the US and a bunch of other countries and the reception has been amazing – the orders are flowing in. 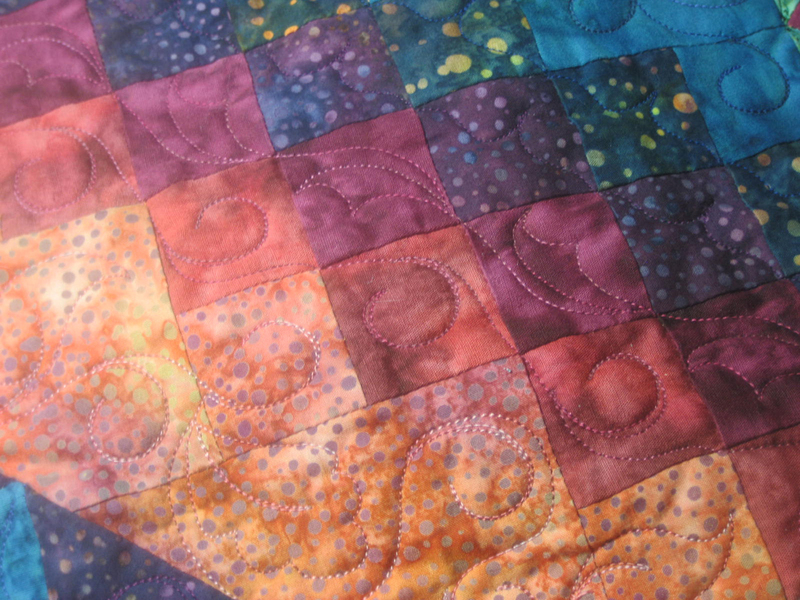 This means that when the fabric is delivered to shops in January, kits for this quilt will be available everywhere! I’ve even heard of a few shops that will be offering it with an additional border to make it larger – I love that idea! One of my favorite special exhibits at Portland’s NW Quilting Expo last weekend was an amazing display of quilts made by the WestSide Modern Quilt Club based in Lake Oswego, Oregon. They spent this year making quilts inspired by photographer Edward Curtis and other Northwest Native American artists. The exhibit entitled “Tribal Winds, A Northwest Native American Exploration”, stood alongside a collection of artifacts and informative panels explaining the rich history of the Native American culture, presented by the Oregon Historical Society. This quilt by Nancy Geddis, is called Haida Eagle Feather. She had lived in Southeast Alaska for many years where she developed a great respect for the many clans that inhabit the coastal areas of the Northwest. The quilt is her interpretation of original artwork she saw on Pinterest. 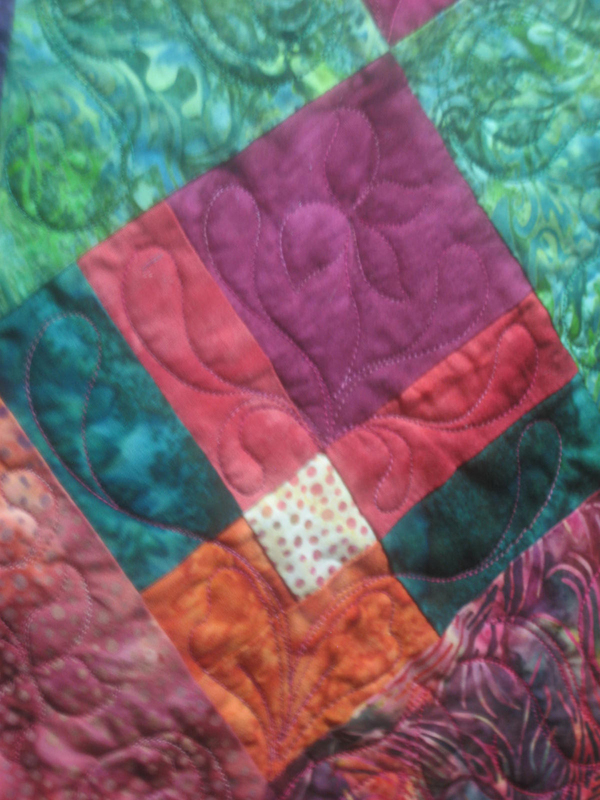 Once All This Was Ours is the name Marjorie Elliott gave her beautiful quilt. She was inspired by the adaptability, beauty and dignity of the heron. Marjorie researched art by Northeast Native American tribes and was drawn to works by many contemporary artist. This quilt is a stunningly beautiful work of art as were many of the other quilts in this exhibit. 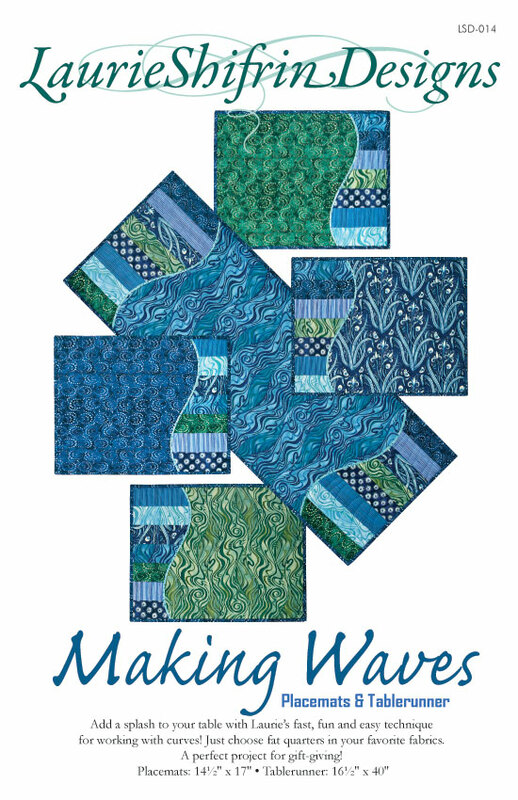 I can’t wait to see what the WestSide Modern Quilt Club comes up with for next year’s Expo. 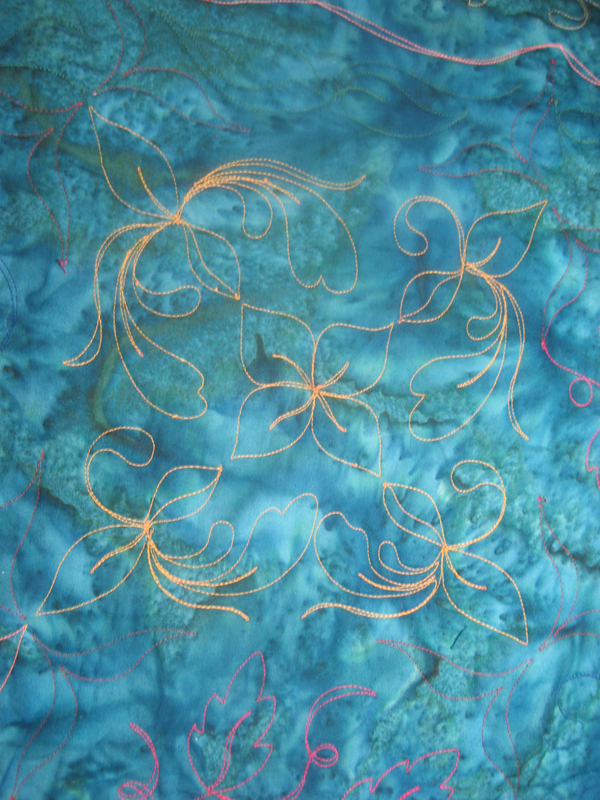 I’m excited to be a Featured Artist at Portland’s Northwest Quilting Expo next weekend! 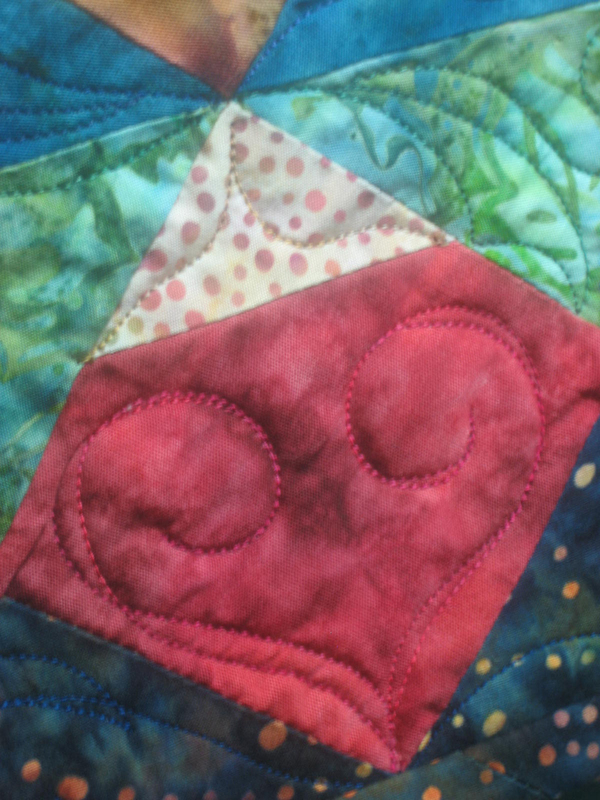 There will be an exhibit of many of my quilts — including Antelope Canyon, my newest design, which makes it’s debut here! And I’ll be teaching three classes and doing one trunk show & lecture. I’ll also have my patterns, books and even some kits available for sale. If you’re in Portland, I hope you’ll come to the show…I’d love to meet you! Show details here: days, times, cost, directions and more! Here’s a link to my Trunk Show & Lecture…I’ll be talking about a couple of my favorite topics! Spiral Sensation: Spiral Sensation is a great technique for a stunning medallion! Crosswalk Table Topper: you’ll make it again and again, for yourself or friends! 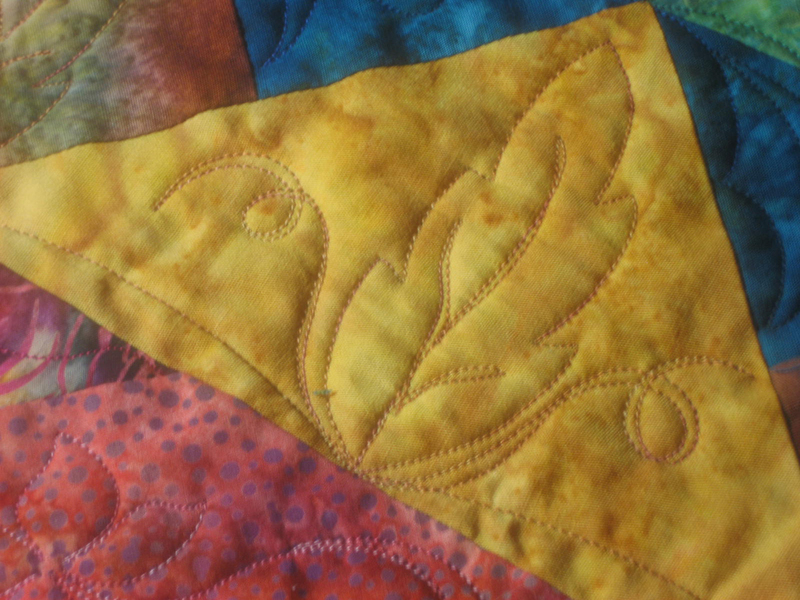 Short Cuts Quilt: this fun and easy new design is already a favorite! I’m looking forward to a fun and inspiring weekend at Expo, and hope you’re a part of it! I’m so excited to share my newest design with you – Antelope Canyon. High up on my Bucket List is a visit to explore the twin slot canyons of Antelope Canyon in northern Arizona. Most of us have seen amazing photos of the swirling oranges of the narrow canyons – just do google images for Antelope Canyon and you’ll see the familiar waves and undulations – and we may not have know where they were taken. Earlier this year, my nephew Dan, a talented young photographer, was lucky enough to visit the canyons, and boy was I jealous! 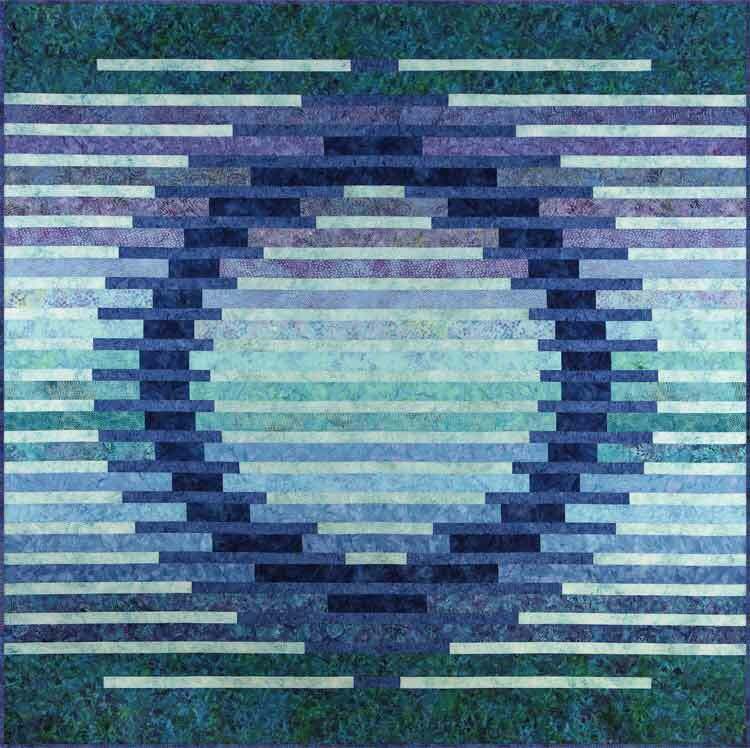 Instead of planning a trip to see for myself, I designed a quilt that brought to mind the feelings I’d imagine experiencing with a first-hand visit. The semicircular design comes from the overlapping of the wide and narrow strips. Many variations are possible with this design based on the values of the fabrics used. 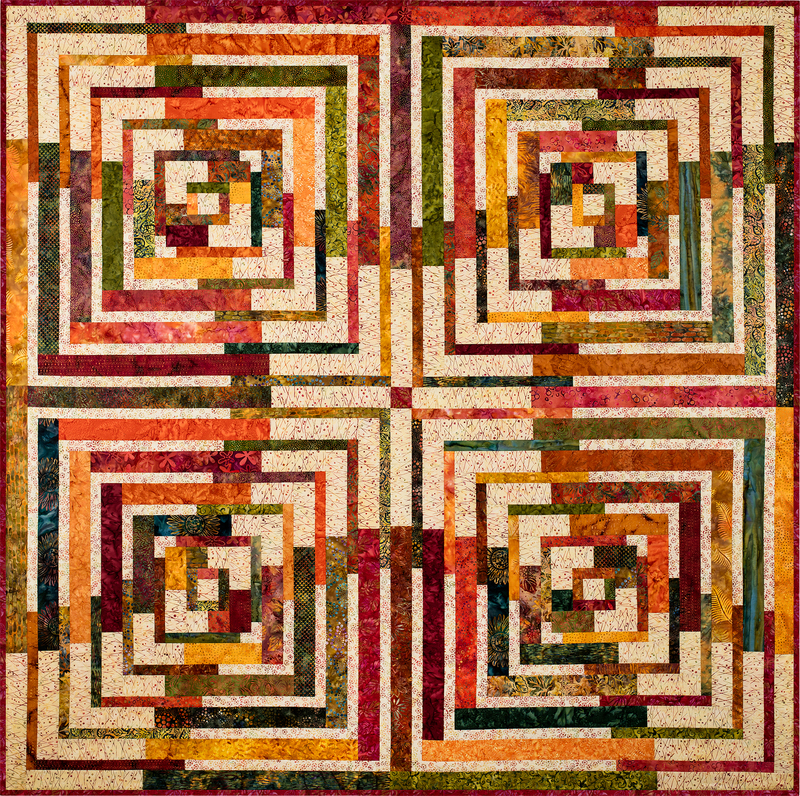 There are 4 large log cabin-style blocks in this quilt, and if you rotate each 90°, you’ll get a large circle in the center for another great look. 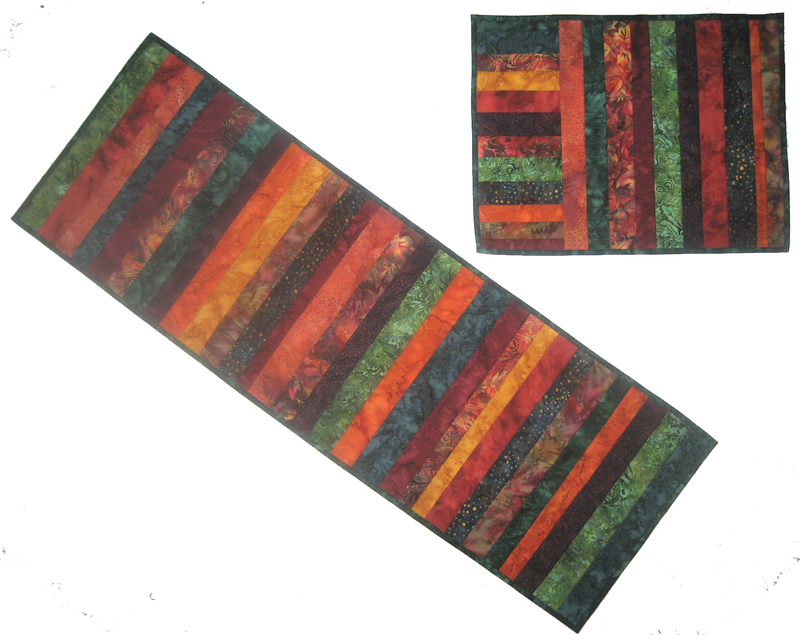 This quilt is 74″ square and uses 2½” strips as well as 1½” strips. 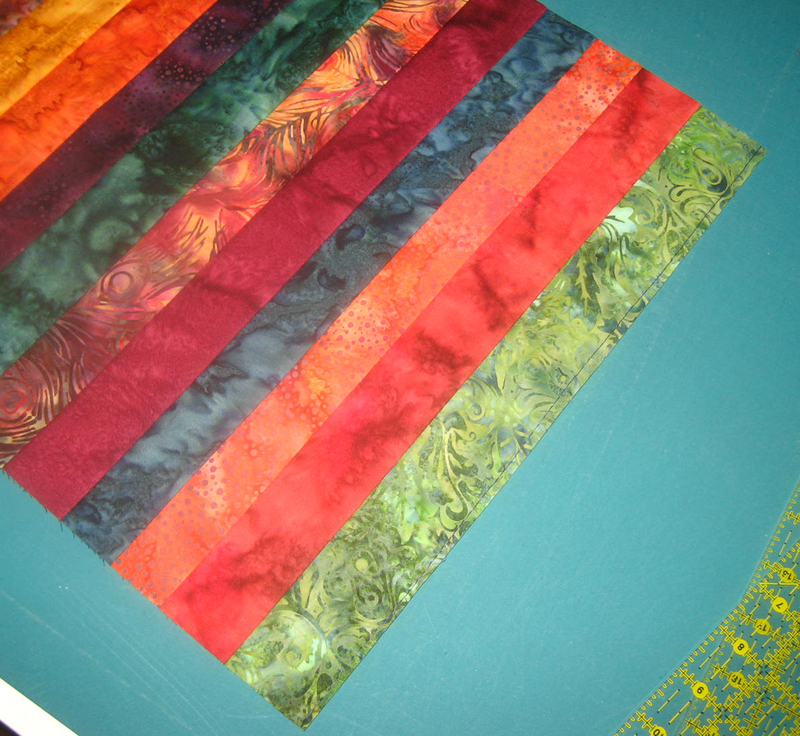 So you can use prepackaged Bali Pops from Hoffman Fabrics or any other 2½” pre-cuts. I admit that I don’t have the pattern instructions ready yet, but Antelope canyon will have it’s premiere at Northwest Quilting Expo in Portland, Oregon, September 22-24. I’ll be one of the featured instructors there as well as having a special quilt exhibit and I’m giving a fun trunk show/lecture on Color and Inspiration. So the instructions will definitely be completed by then!!! I’ll take pre-orders by email: laurieshifrin@aol.com. Gorgeous photo by Deb Hollister. 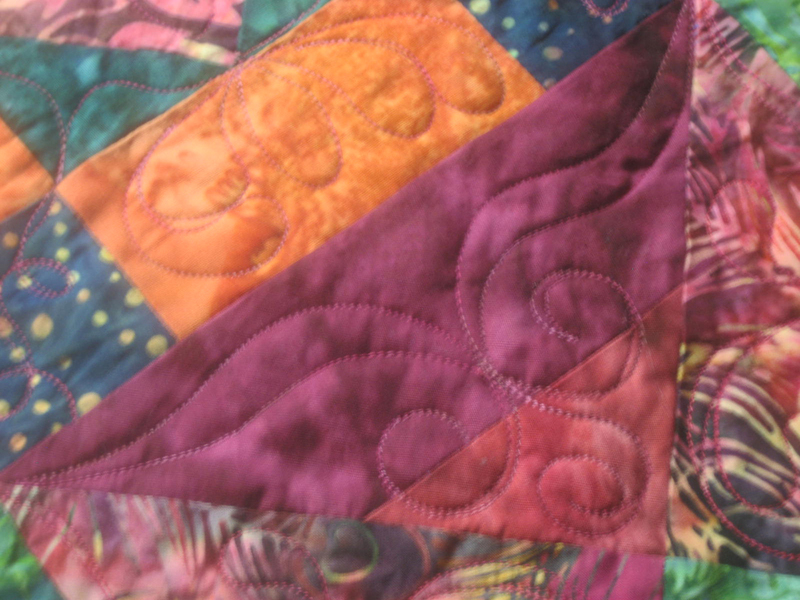 By now, I know some of you have finished your quilt and are eagerly awaiting ideas for how to quilt your masteriece! I know this because a bunch of you have contacted me and I’m determined to get this on my website this weekend. So, in my desire to just get this done, I’ve decided that no great philosophical text is needed about why I designed the elements the way I did. You just need photos so here they are! If you click on the photo you can see a close-up. I apologize for the poor quality – I couldn’t figure out how to get a good close-up without the haze. Someday I’ll take a photography class (in my free time!). 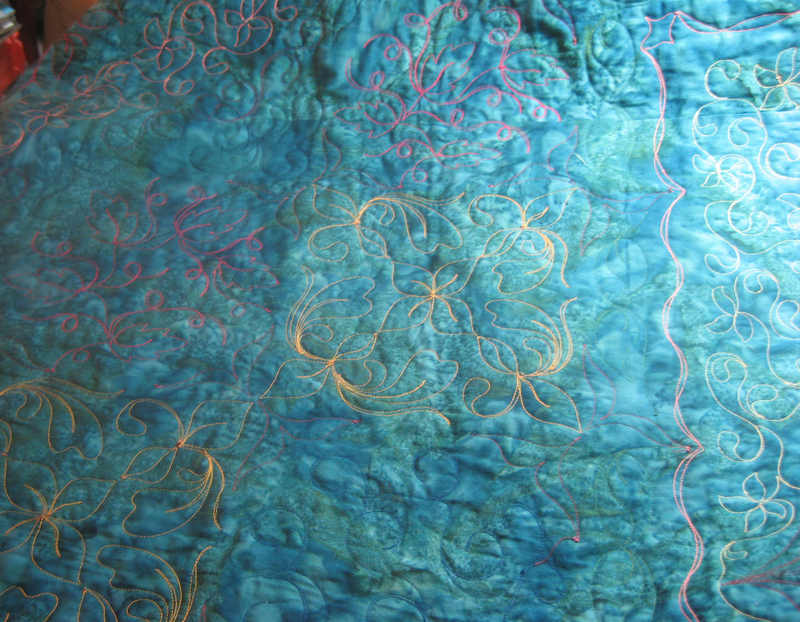 I drew ideas for my quilter, Carrie Peterson, and she refined them to suit her quilting style. I provided her with a few dozen spools of thread, mostly King Tut variegated quilting thread, and she changed threads (top and bottom) for each fabric she was quilting. I can only imagine what a laborious task that was, but you can see the results for yourselves – spectacular!!! NATURE’S JEWELS BONUS PROJECT – What should you do with all of the leftovers from making Nature’s Jewels? 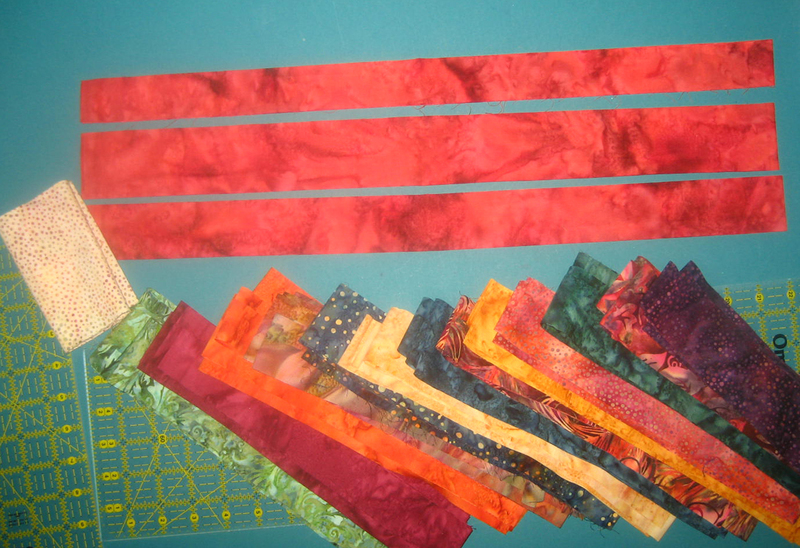 As promised, I’m offering a bonus project that uses leftover strips and smaller pieces that you can make with any group of fabrics – not just the batiks from Nature’s Jewels. This long quilt can be used as a narrow runner for your bedroom dresser, to complement the quilt on the bed. It can also be used as a long, skinny wallhanging if you have a narrow wall space that needs a piece of art. Or you can make the runner and placemats as a setting for your table. You will have different size pieces left from cutting your BOM monthly assignments. 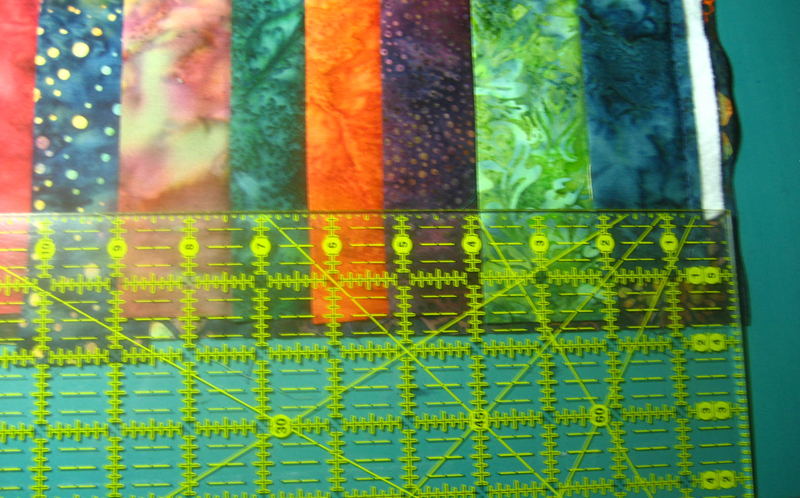 And if you cut the whole quilt at once, you probably have at least ¼ yard left from each fabric. You can adjust the length of the strips to the pieces you have. 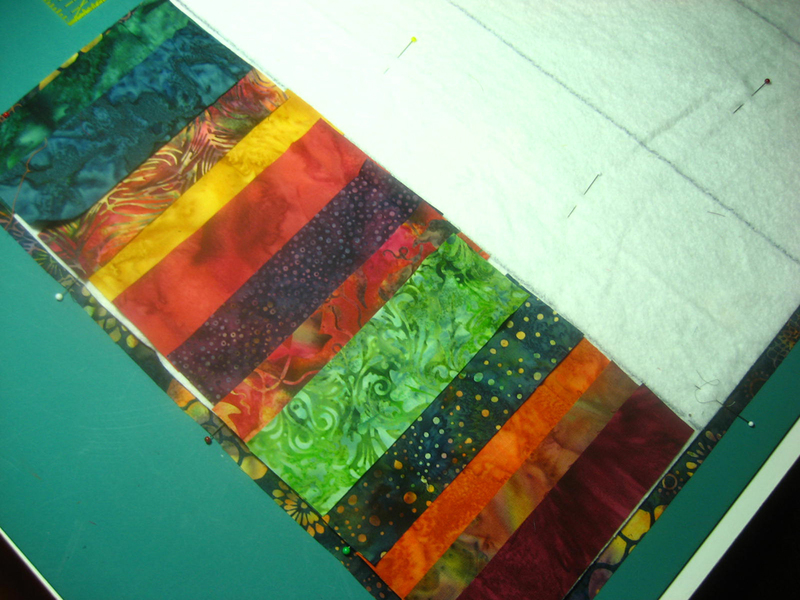 For the version shown above, I would suggest that first you cut the longest strips you can from each of the fabrics, ranging from 1 ½” to 3″ wide. If the strips are the full width of the fabric – great! If you have some that are as short as 5″ or 6″ inches, that’s fine too. It’s time to think about how wide you want your finished runner. Of course, if all of your strips are only 10″ long, then you’ll end up with a runner approximately 9″ wide. 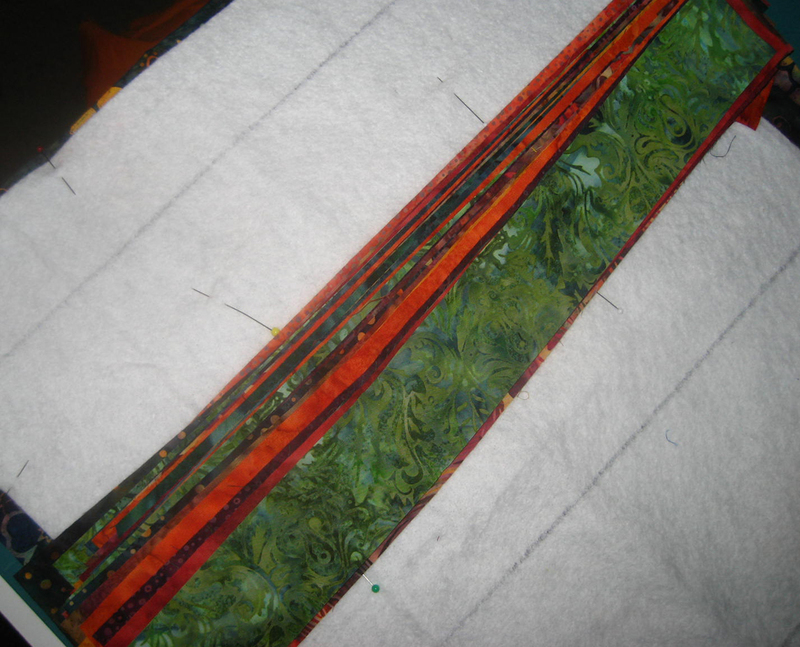 But if you have strips the full width of fabric, you can cut the longer strips into shorter lengths as I did. 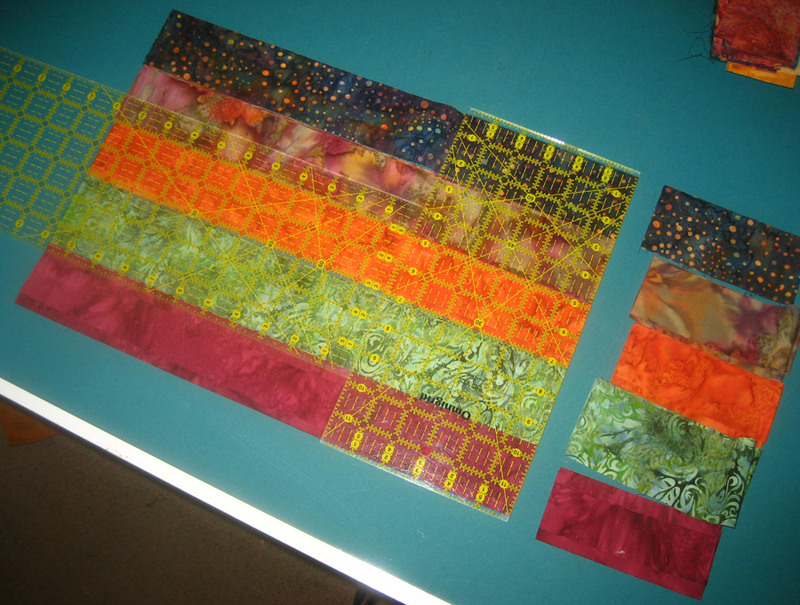 I cut each 42″ long strip into 3 pieces – 2 about 17″ long (for a runner 14″-15″ wide), and a 3rd about 6″ – 7″ long (used in the placemats). You’ll need approximately 30 or more longer strips for the long runner. For each placemat, you’ll use approximately 10-12 longer strips, plus 12-14 shorter strips for the short perpendicular strips on the left side of the placemat. It’s nice to have extras of each length so you have choices in the arrangement of colors. 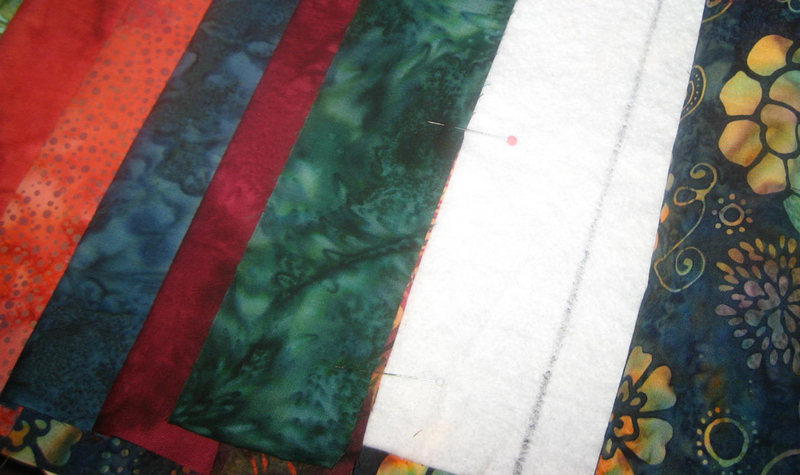 You can see in the photo 2 above, that I cut a variety of widths from each fabric. I chose to leave out the lightest fabric – the cream with dots. I thought it would stand out too much for my taste. Eventually, I eliminated the light sandy colored fabric for the same reason. 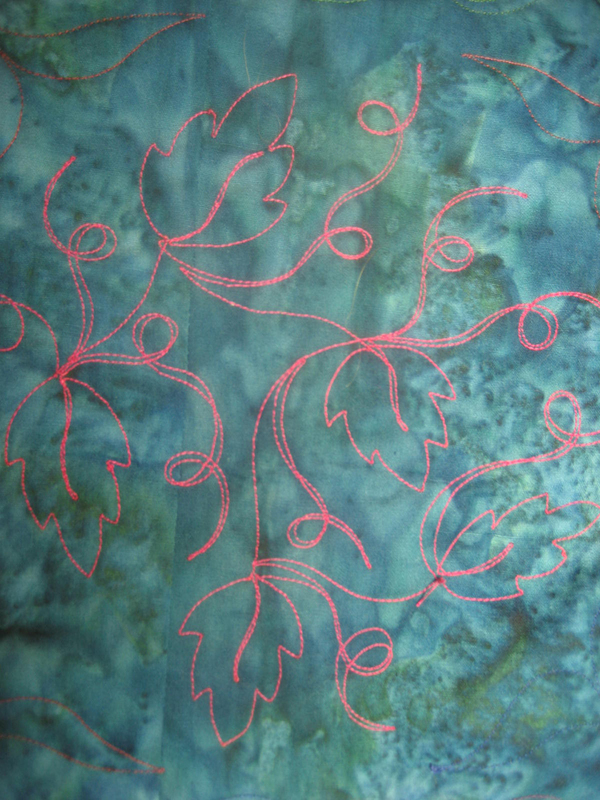 In the Variations section at the end, you’ll see an option for incorporating the lighter fabrics. This whole project can be done in 2 ways: you can piece the tops in the usual way, sewing the strips together to form the top, then layering with batting and backing and quilting. Or, you can do it as I did, in a quilt-as-you-go manner. 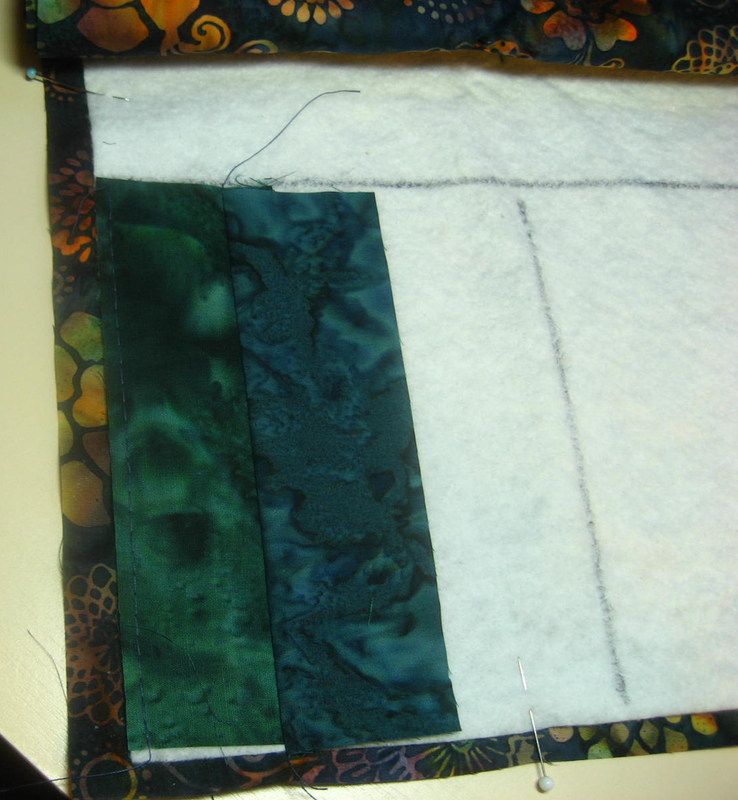 I love doing it this way because you are essentially quilting the project as you add strips, and there’s no need to add any quilting later because you are stitching through all 3 layers. If you’ve never tried this technique, now is a great time to give it a try. The directions continue using the quilt-as-you-go technique. 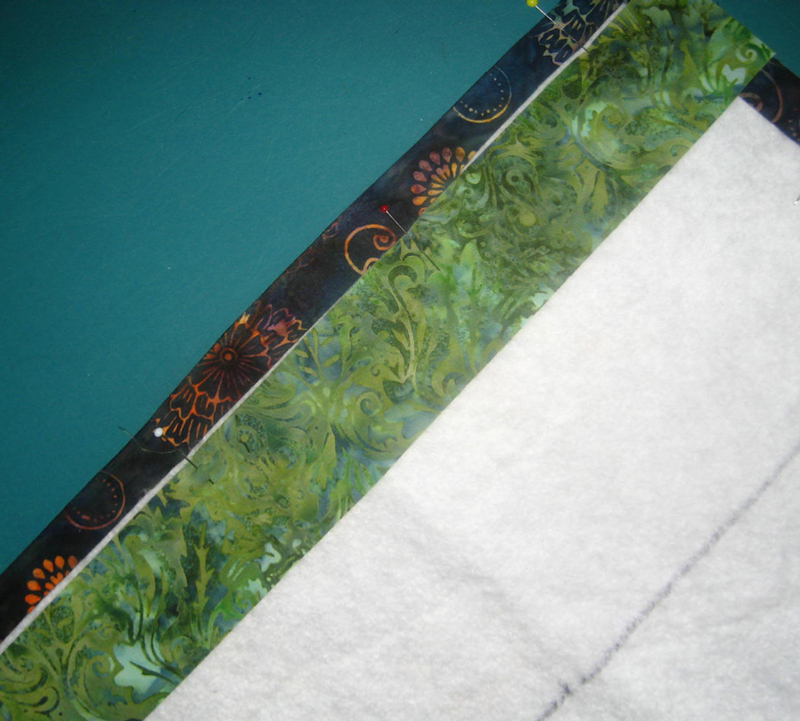 For the runner, start by preparing the backing about 2″ wider than the longer strips (my strips were 17″ so I cut the back about 19″ wide by the full width of fabric (approximately 42″). Cut a piece of batting about 1″ narrower than the back and a little shorter as well(either a flat cotton or Pellon fleece works well). Tape the backing to a large flat surface, right side DOWN. Place the batting centered over the backing. In order to keep the strips straight as you add them in the sewing process, I found it helpful to mark some lines on the batting as guidelines. I used a fat Sharpie marker and a 6″ x 24″ plexiglass ruler lined up with the straight edge of the backing. Mark lines perpendicular to the long edge of the backing, approximately 4″ apart (the exact distance between lines makes no difference). Be sure to have a line about 2″ from each end. It’s best not to do any more smoothing or the batting may shift and distort the straight lines you just marked. Pin the batting to the backing along the outside edges and between lines. This will keep the batting in place as you manipulate the project while sewing. But, be forewarned – you will need to remove each of these pins as you approach them in the sewing. 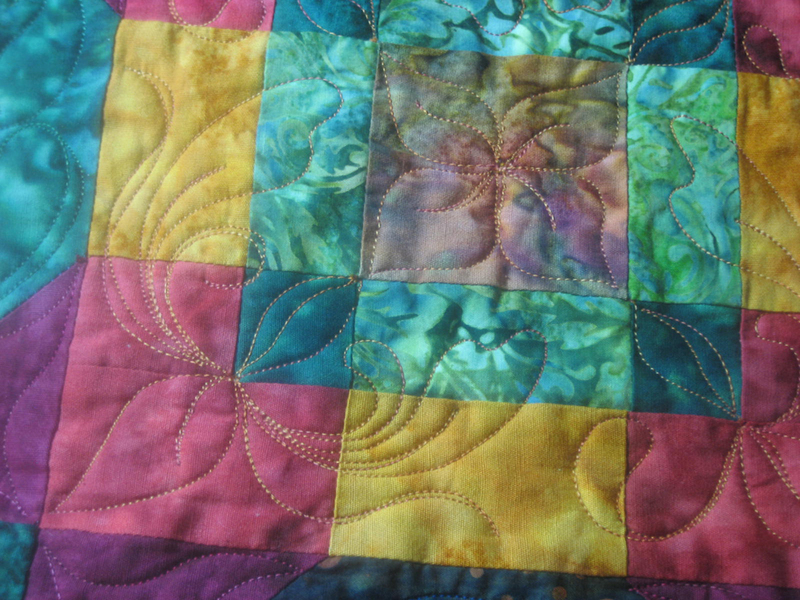 Please don’t sew any strips covering the pins – it’s would be very hard to remove them! Now comes the fun part! 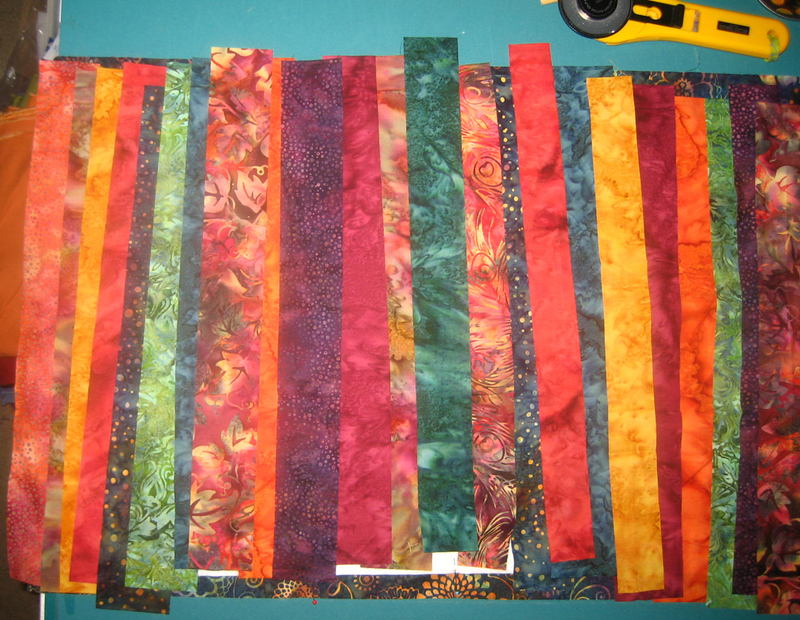 Take your group of longer strips and place the strips over the batting arranging the colors in a pleasing arrangement. Overlap them a little (about ½”) so you can see approxiamtely how many you’ll need, and be sure to use a variety of widths as you go. You’ll probably use about 30 strips to cover the distance, but this number may change as you sew. Feel free to rearrange until you are happy, keeping in mind that there is no perfect order and many versions can be pleasing. Once you are happy, stack the strips one on top of the other, keeping the order intact. Remove the tape from the backing and head over to your sewing machine. Beginning at one of the batting/backing setup, place the first strip, right side UP, parallel to the marked line and selvage edge of the backing. Pin the edge closest to the backing selvage to the batting/backing. Pin the strip in place, through all layers. For ease in manipulating the batting/backing, I rolled the opposite end up, unrolling a little as I added each strip. Sew the edge furthest from the selvage through all layers. Use a stitch length that is 9-10 stitches to the inch as it is going through lots of thickness. Finger press the second strip open over the batting. Do a good job of pressing at the seam, but be careful not to shift the batting beyond the strip. Using a basting stitch, stitch the first edge of the first strip through all layers, a scant ¼” from the edge of the strip (you can do this before you add the second strip if you want). It’s fine to finger press the first few strips if you do a good job of it, but be sure to give it an iron pressing after every few strips are added. If you are using polyester batting, it’s safest to not place the iron directly on the batting (use a press cloth if needed). Continue adding strips from your stack of strips in this manner, being sure to remove all pins before you sew over them. As you place each next strip, check that it is parallel to the marked lines. 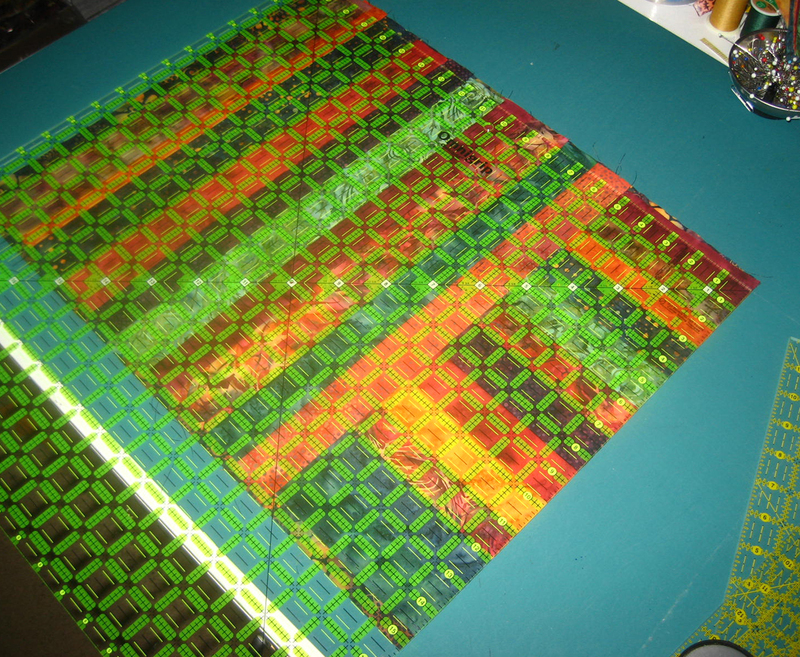 If the strips are shifting, just place the next strip parallel, regardless of the one under it (as you can see I did with the green strip). 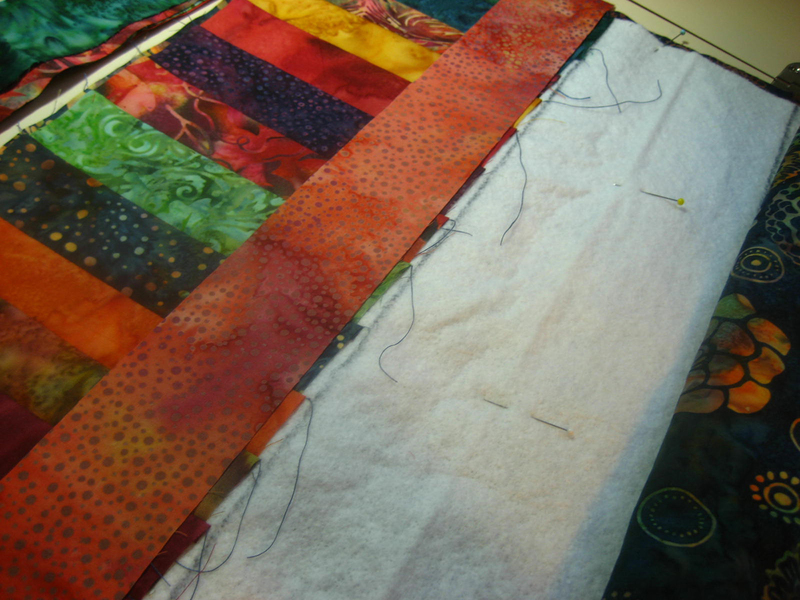 When you are about ¾ of the way done, assess whether you will have too many or too few strips to complete the top. You can rearrange to add or reduce the number of strips at this point. You’ll want the last strip to come within ½” or so from the edge of the batting. Pin the last edge and baste it as you did the first edge on the first strip. Give the quilt a good pressing. Now it’s time to trim the runner. You should still be able to see the edges of the backing – that is your straight edge reference point. If you can see the backing better on one long edge, start with that edge. (Sorry for the blurry photo.) Trim parallel to the batting, trimming enough so that you cut just slightly into the batting. It is important that after trimming, there is batting all the way to the edge of the fabric. Trim the opposite long edge, PARALLEL to the long edge you just cut (not parallel to the backing of the uncut edge). This will ensure that your runner is the same width from start to finish. I used a 2-ruler method to do this as shown. Next, trim each of the short ends, perpendicular to the long neatly trimmed edged. Don’t trim so much that you cut off the basting. 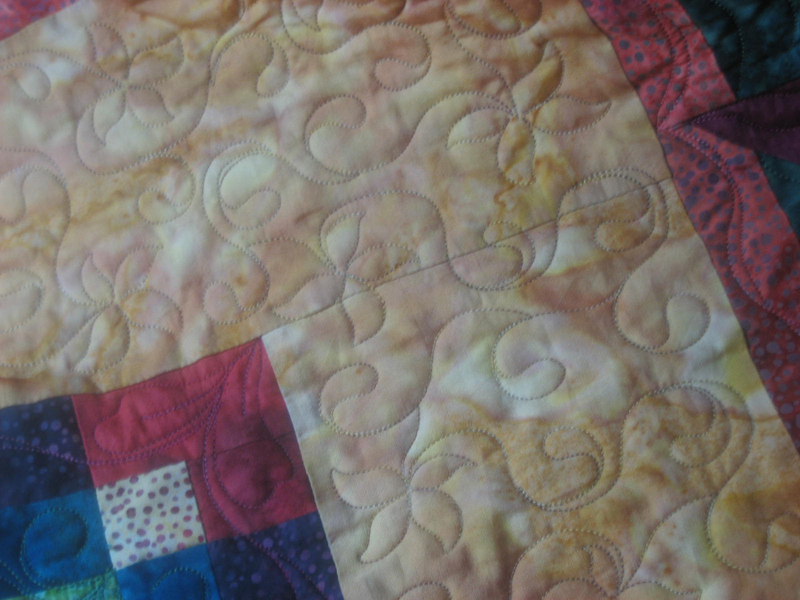 You now have the runner complete except for the binding – and it’s already quilted! I liked the idea of having a narrow pieced area where the silverware and napkin will rest. This is also a place to use your shorter leftovers. 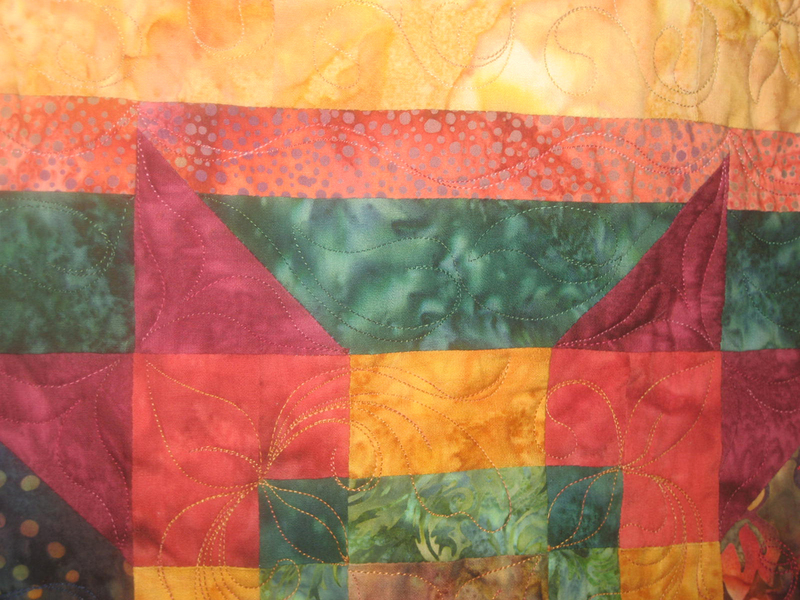 In the Variations section below you’ll see another piecing idea for this section. For the above version, it’s best to start by making just one placemat. For a placemat that ends up approximately 14″ x 19″, cut a backing piece that is 17″ x 22″, and a piece of batting that is approximately 16″ x 21″. As you did for the runner, tape the backing to your table, right side down. Place the batting centered on the backing. Mark a line that is 6″ in from one of the shorter edges. This is the guide for the perpendicular strips. Mark a few lines parallel to the first, about 3″ – 4″ apart. Pin the batting to the backing. I also added a few lines in the first 6″ area, perpendicular to the first line you marked, to help me keep that are straight (you can see one of the lines 2 photos down). Gather the shorter strips (6″ – 7″) and arrange about 12 strips along the shorter side as shown, overlapping each about ½” (above). Place about 11 of the longer strips next to the shorter as shown. 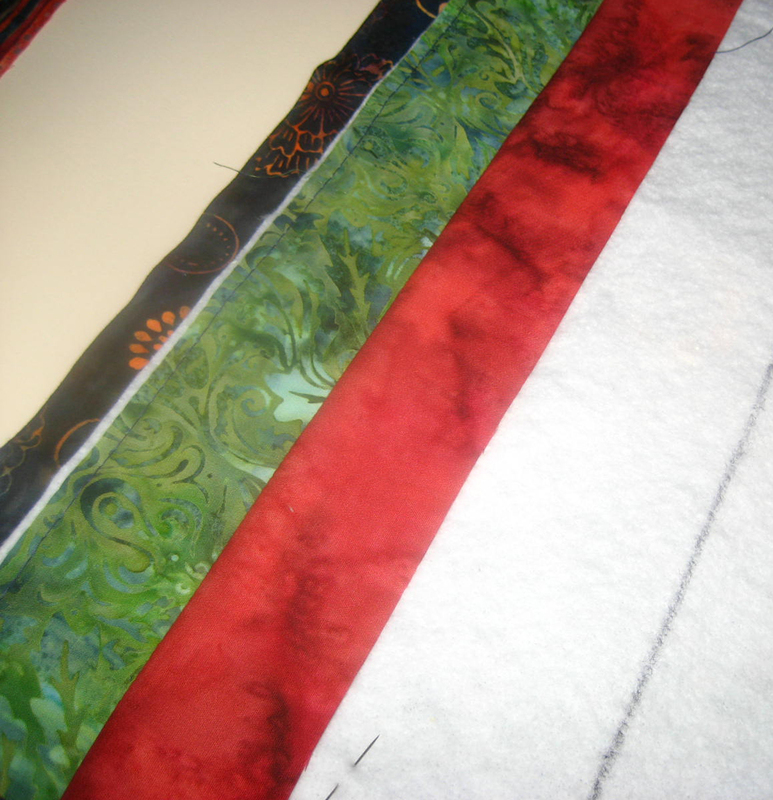 I chose one of the lighter fabric strips for the first, so it would mark a clear end to the shorter section. 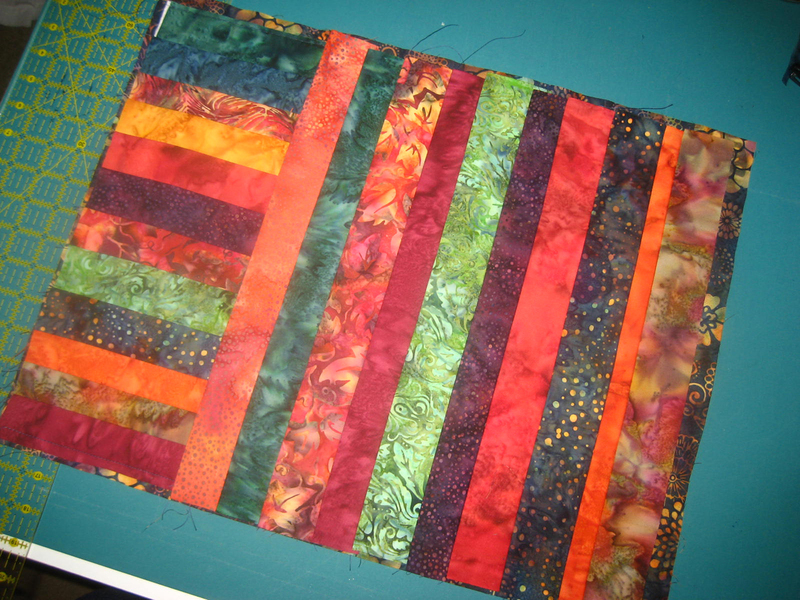 After you’re pleased with the arrangement, gather the strips into stacks as you did for the runner. In the same way you began the runner, pin then baste the first edge of the first strip through all layers. Keep the first marked line visible to use as a guide. 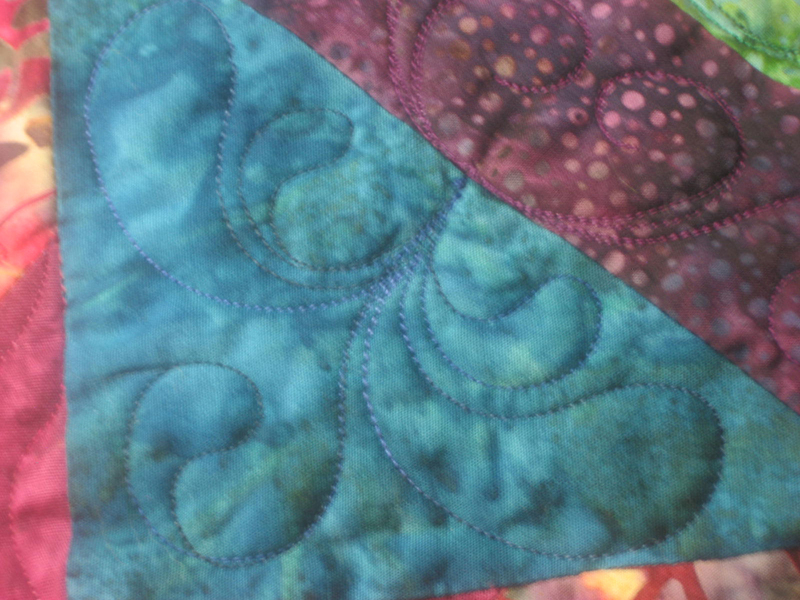 Place the second strip over the first; pin and stitch through all layers. 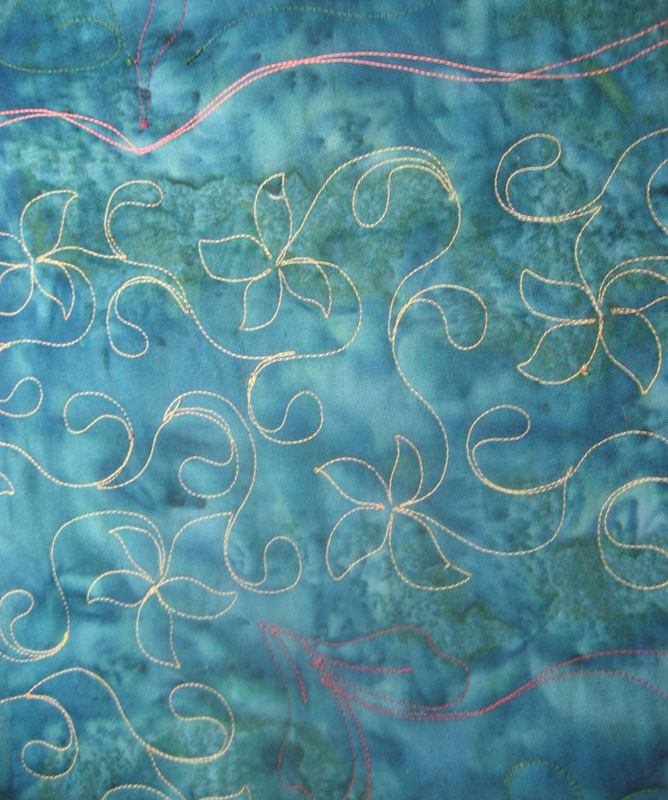 Backstitch at the end closest to the 6″ marked line. Finger press open. 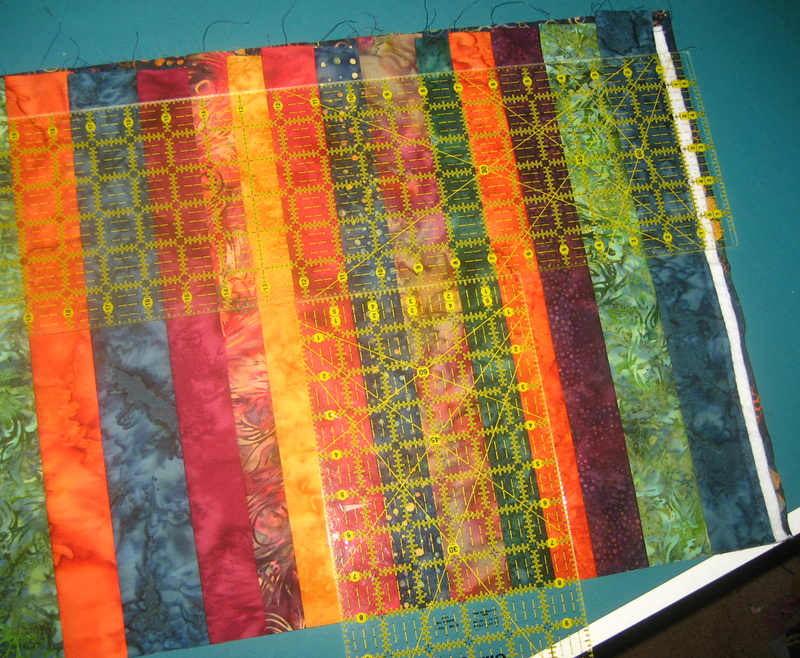 Continue adding strips, pinning, stitching and finger pressing. Give it a good pressing when done. Once the section is done, place the first long strip over the edge of the shorter section. All that is important is that it’s parallel to the marked line and that you’re sure to see all the ends of the shorter strips. 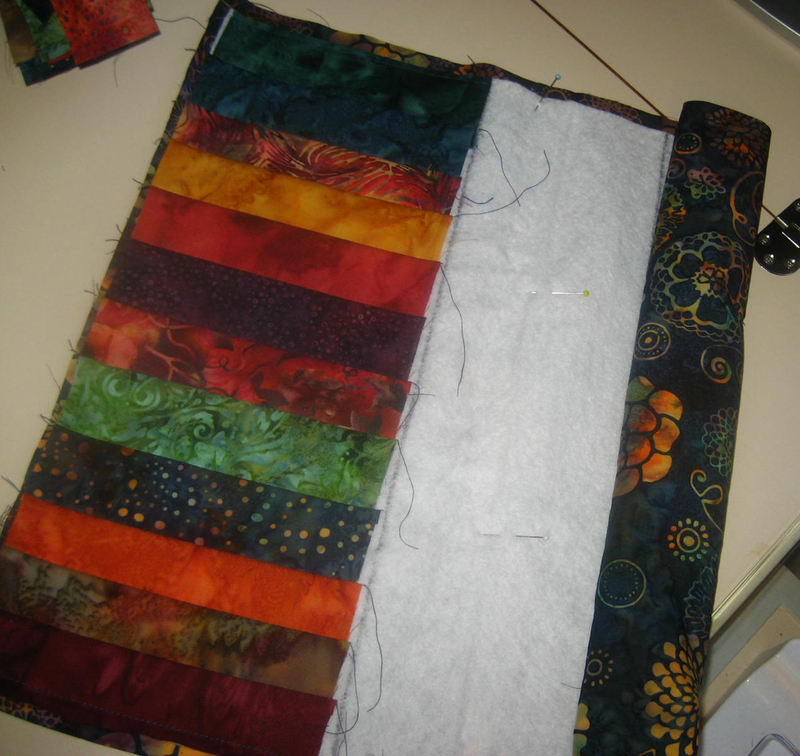 Pin the long strip in place and stitch the right edge through all layers. Finger press the strip open (to the right over the batting). 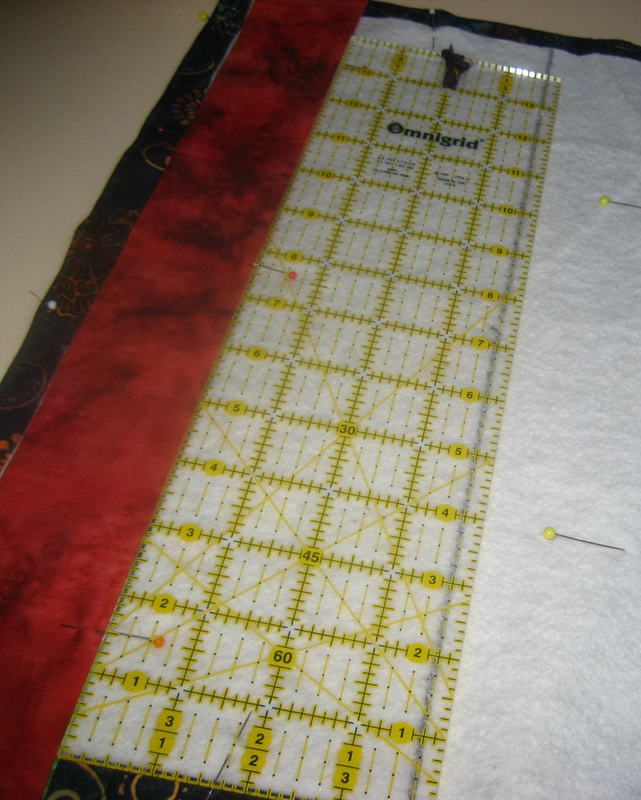 Place the 2nd long strip on the 1st; pin, stitch and finger press open. 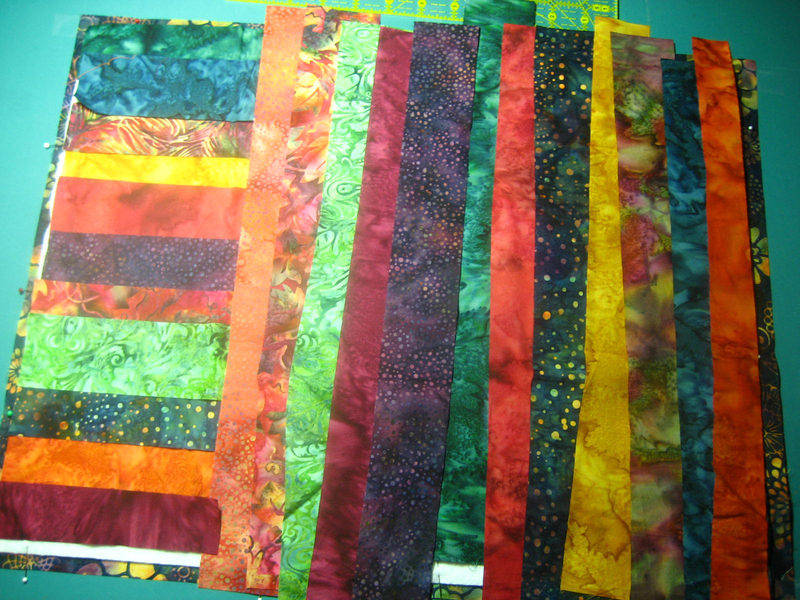 Continue adding strips until all are sewn (you can check to see if you have enough or too many when you are partway done). Baste the last edge of the last strip. Give the whole thing a good press. 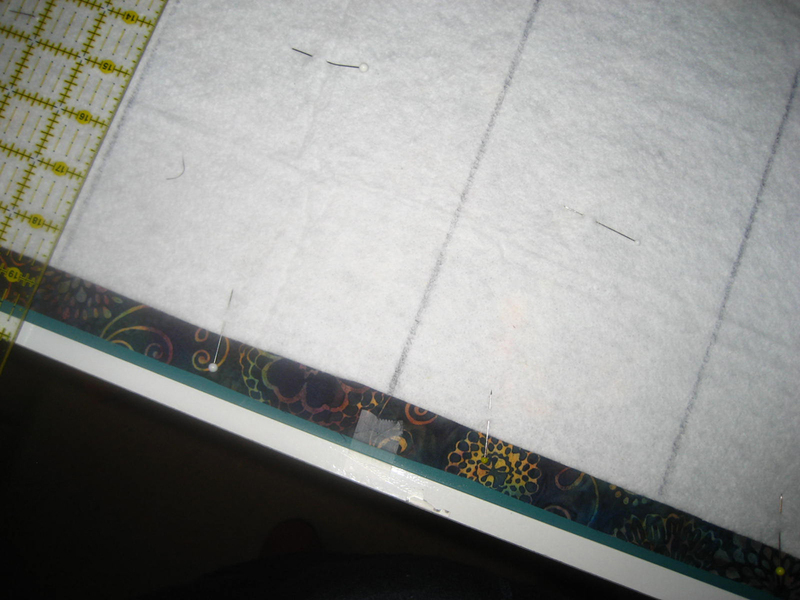 In the same way you trimmed the runner, trim the 2 longer edges parallel to each other. Then trim the shorter edges perpendicular to the long edges. I suggest waiting until you get all of the placemats pieced before trimming so that you can make them all the same. I love to use my favorite 22″ square ruler for trimming placemats. Bind your runner and placemats using your favorite technique. Don’t you hate when directions say that? 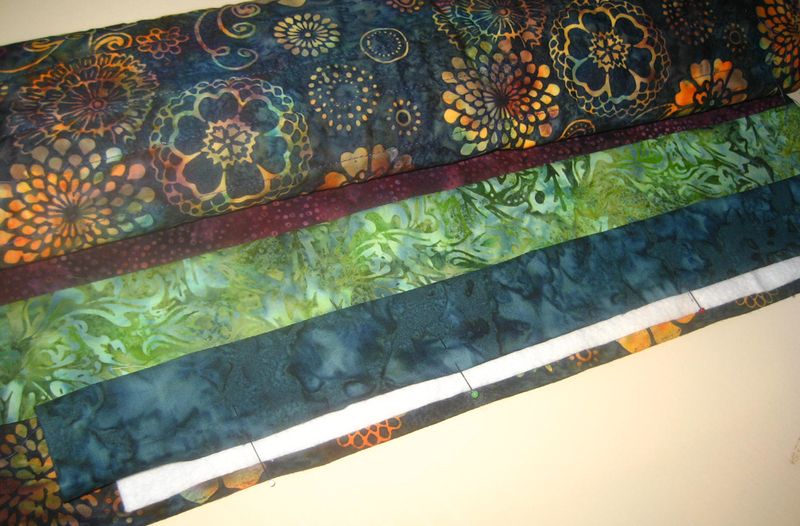 Well, I figure if you were able to make Nature’s Jewels, then you certainly have enough experience to have decided which way you like to bind your quilts! 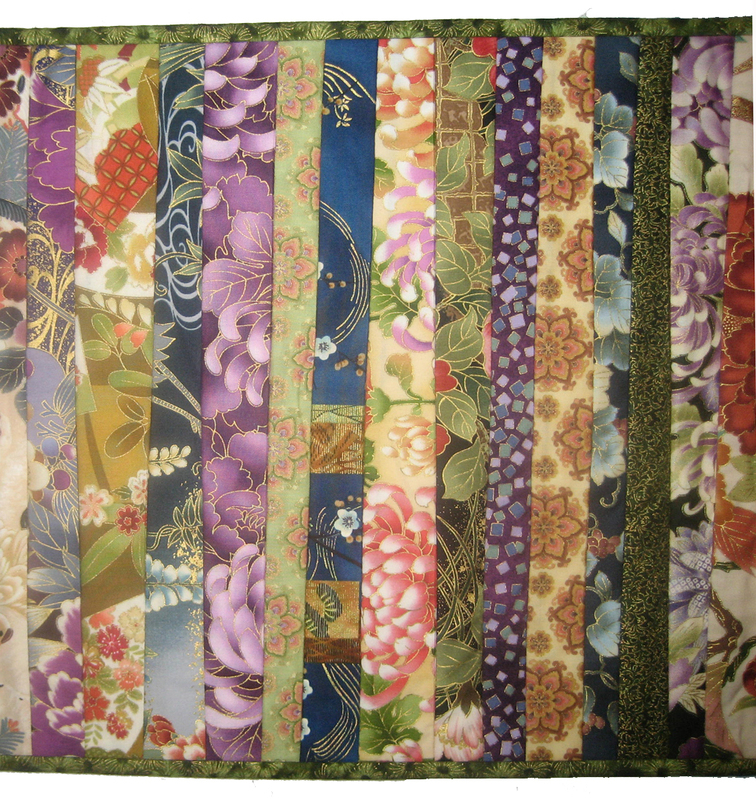 The first time I made this project, I used Asian-inspired fabrics and sewed them so that they weren’t all parallel. I like the irregular angles, but I found that it was still useful to have the marked lines, so you could tell it you were getting too far off straight. To do this, start with a variety of width strips exactly as you did above. When you place the second strip over the first, just place it at a slight angle as illustrated below. Alternate the direction of the angle so you don’t get too far from straight. 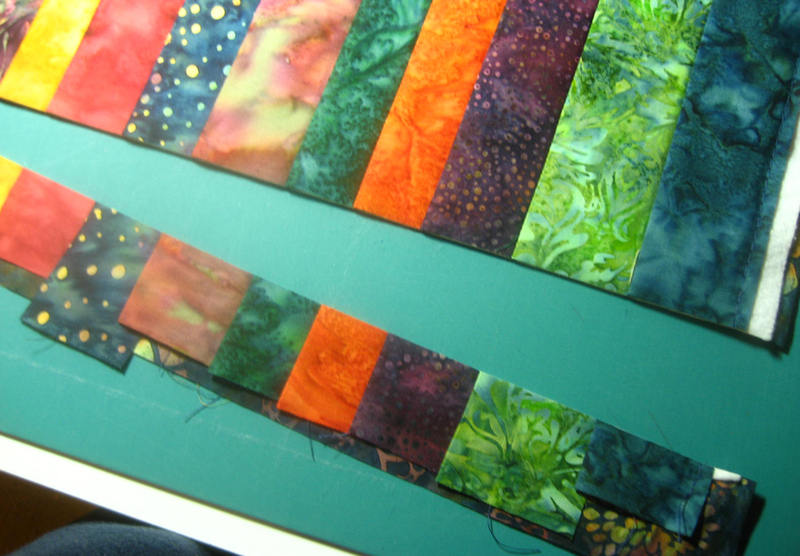 A fun way to include the light fabrics I eliminated would be to insert small squares or rectangles into the longer strips, at random distances from the edge of the strip. Then when the strips are placed, be sure the light bits are at random spots around the runner as illustrated. 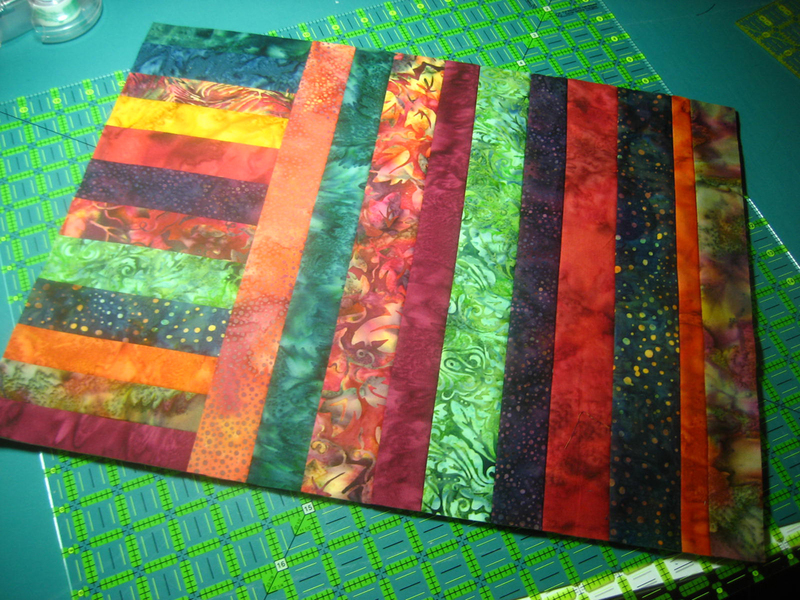 You can use the odd-sized smaller scraps to create a crazy-quilt type section to use instead of the shorter strips. 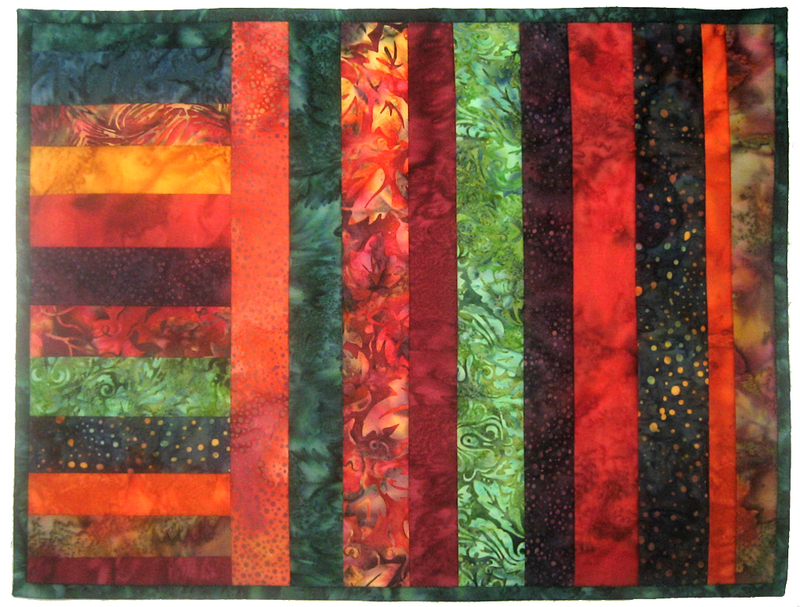 Use your imagination and see what fun patchwork you come up with. 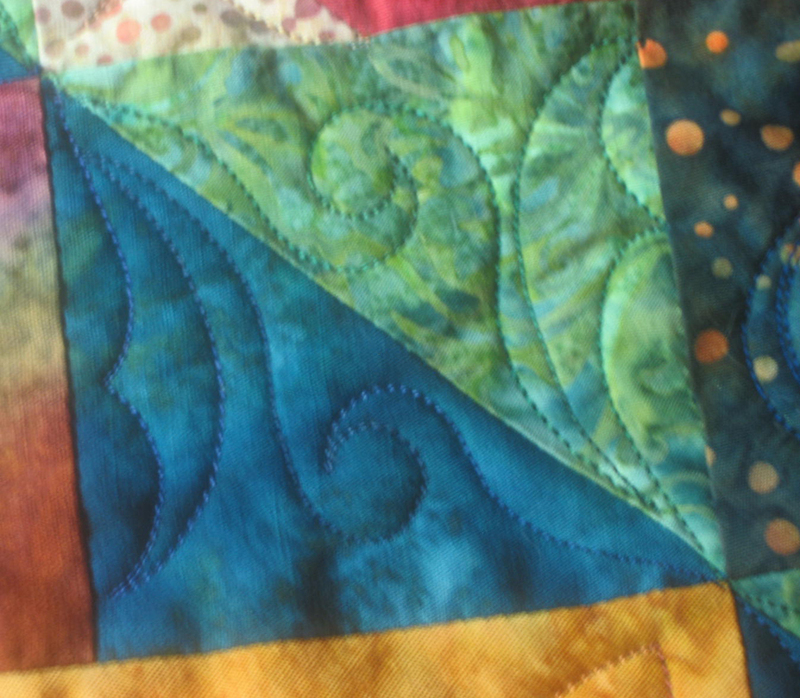 You could have one of these pieced sections at either end of the runner using more of your smaller leftovers (I like this one). 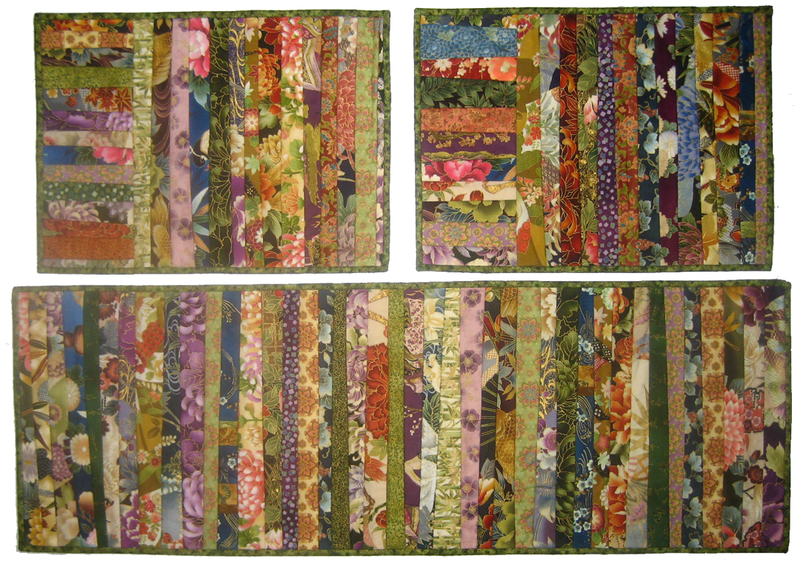 What a great way to use scraps – there is no limit to the variations! Have fun!! !